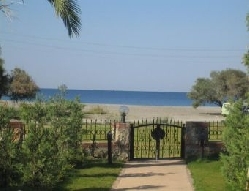 Beautiful 3 Bedroom Villa, with Back Garden on the Beach! The beach at the back of the garden! 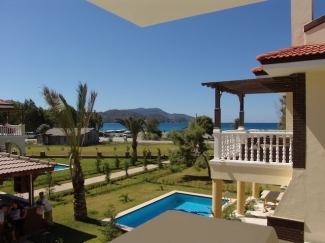 This superbly finished villa, with the back garden virtually onto the beach (40m) combined with the stunning breathtaking views across the mountains, the wonderful fresh air, and the amazing magical sunset, is something which will provide guests with such great pleasure. 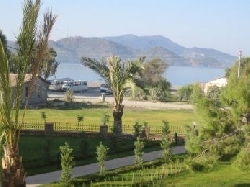 The "Seaside" complex, consisting of 40 high quality villas, is situated along the Calis beach, 20 minutes stroll along the "turquoise coast" to the main town of Fethiye, bringing you, beauty, tranquility and fun. A new water park, just 2 minutes ride confirms the family resort atmosphere, and if you want the relaxing "take it easy" holiday, the bus (Dolmush) stops right outside the complex, and will take you a 2 minute ride into Fethiye. 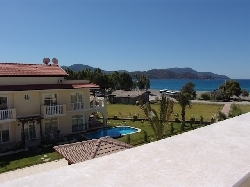 Or if you prefer not to venture into Fethiye, there are many fine restaurants all within walking distance. A supermarket selling bread, cheese, milk, yogourt and the essentials is just 2/3 minutes walk. 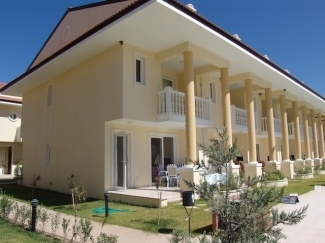 Very spacious villa, with 160sqm of living accomodation. 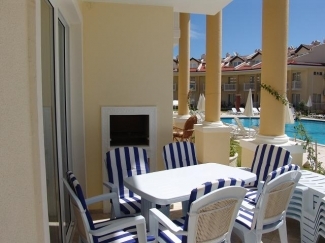 3 bedrooms, 1 double, 2 twin, and a double sofa bed - sleeps 8. All bedrooms with their own bathroom. Flights are to Dalaman (45 minutes transfer time) - airport transfers can be arranged. The ground level consists of a fully equipped kitchen, with oven, hob, microwave, washing machine, dishwasher, toaster, fridge-freezer, and a tastefully furnished lounge, with Sky TV, and a dining area with seating for 6, along with a guest cloakroom. There are patio doors leading from the lounge, with beautiful patio furniture, built in BBQ, 6 sun loungers, and everything you need for dining alfresco. This terrace views over the pools. The two upper floors contain the bedrooms, all with terraces, with views of either the pools, or mountains. Bedlinen and towels are provided, along with a welcome pack. All bedrooms and lounge are fully air-conditioned. Price includes cleaning and a basic welcome pack, as well as linen and towels.